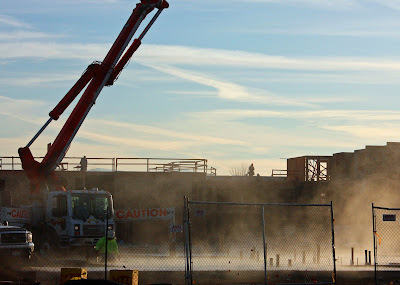 Steam rising from concrete at a construction site yesterday morning. I believe this is going to be an assisted living facility. We've seen three of these go up in our area of town in the past year. It must be a big business...or it's going to be a big business as Baby Boomers age. Is the steam because of the cold? My husband has done this work for over 28 years.I will have to show him this shot. Assisted living? We haven't reached that point yet, though we may soon enough. It's still unthinkable for most Filipinos not to take care of our old folks. That steam is fascinating. I've never seen anything like it in our construction sites here (just lots of dust and dirt!). Is it cold there now? Hi Hilda - assisted living is usually not an instance where relatives won't take care of an elder, it's more like downsizing to an apartment, where you get dining service and maid service. A luxury for older people who can afford it. And yes, it's cold, below the freezing mark at night...in the 40s in the day. Oh. Thanks for the explanation! 'Assisted living' sounded like another term for a nursing home to me. Stay warm, BD! I'm never going to survive outside the equator, I think.